Local taxi driver Dean asked us to give his new business a web presence that would help him attract more tourists as clients. Being based near Chipping Norton, he chose the name Chipping Norton Taxi and we registered both the .com and .co.uk domains for him. We then produced a simple, single-page website for him, and when the business took off within months, Dean asked us to expand and redesign the site, which we have now done twice over the years. John and Emma Stolwood are a local couple who set up their own architecture business. John is an RIBA Architect and Emma a Landscape Architect, and they wanted a simple website based on the same template as the Emma Skippins website, and two years later they asked us to redesign the site. We host the website for them and they update the site themselves using a content management system. A cleaning company based in Shipston-on-Stour approached us to make a website for their new business. They had a logo already designed so we built the website based on this, with an initial web presence created and active within days. The website was designed to work on both mobile devices and computers. We later added a web form which customers can use to contact the company, with the customer's responses sent by email to the business. Shipston-based dog training business Pack Leader Techniques, run by Gilliana Elliott, asked us to set up a website for them based on their textured business card. Gilliana provided some of her great dog photos to use on the website, and we set it up so that she could edit the website using our free CMS. We have since made additions to the website including Google Analytics tracking so that Gilliana can see how many people have visited her website. The success of the Chipping Norton Taxi website led to expansion of the company into other areas in the Cotswolds, and we were asked to design a website for Charlbury Taxi and Minibus, based in Oxfordshire. This website was designed to be an executive car and minibus hire service. 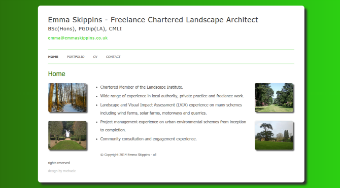 Emma Skippins is a local landscape architect who wanted a basic website for her freelance business. She showed us a few sites she liked, and her business card, and we then registered a domain name for her and created a site which we host. We set the site up so she could edit it herself using my free CMS, could track visits using Google Analytics, and send email using an email address from her new domain name. 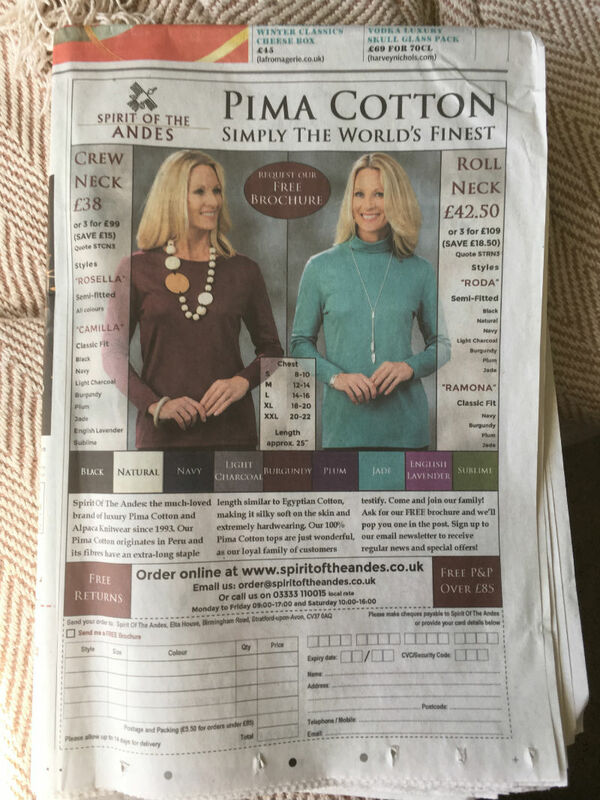 Shipston Area Flood Action Group (SAFAG) also wanted a simple website they could edit themselves based on the template used for Emma Skippins. We host the website for them and provide an 'as-and-when' support service when there are amendments or improvements they want us to make which they cannot make themselves. A local parish council for the villages of Cherington and Stourton approached us to design, develop and host a website for them. They wanted to edit the website themselves to publish their agendas, minutes and other documents. We created a one-page website and provided a free content management system (CMS) to enable them to do this, and trained them on how to use it. We also set up a cloud-based archive facility for old documents, with accounts for both admin and for council members. 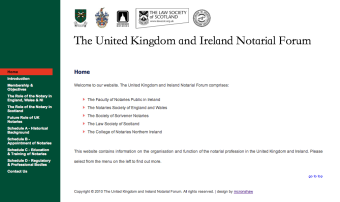 The United Kingdom and Ireland Notarial Forum is a legal organisation comprising notary groups from around the UK. The organisation wanted a website to contain information that was previously only available as a booklet. They approached us to create a website for them, and were happy with the first attempt at a look and feel for the website. We now host and maintain the website for them. Crick is a village near Rugby. They already had a number of websites but they were unattractive and not very easy to use. 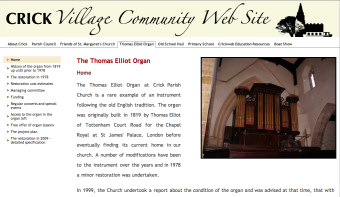 They initially approached us to redesign the church organ restoration website, and they were so happy with the results that we worked with them to redesign an umbrella website called "Crick Village Community Web Site". They now host and manage the website themselves. Frank Guides offers guides to online web companies and services. We researched, designed, built, wrote and set up this website, opting for a low-graphics, "white space" website, as used by companies such as Yahoo and Google. 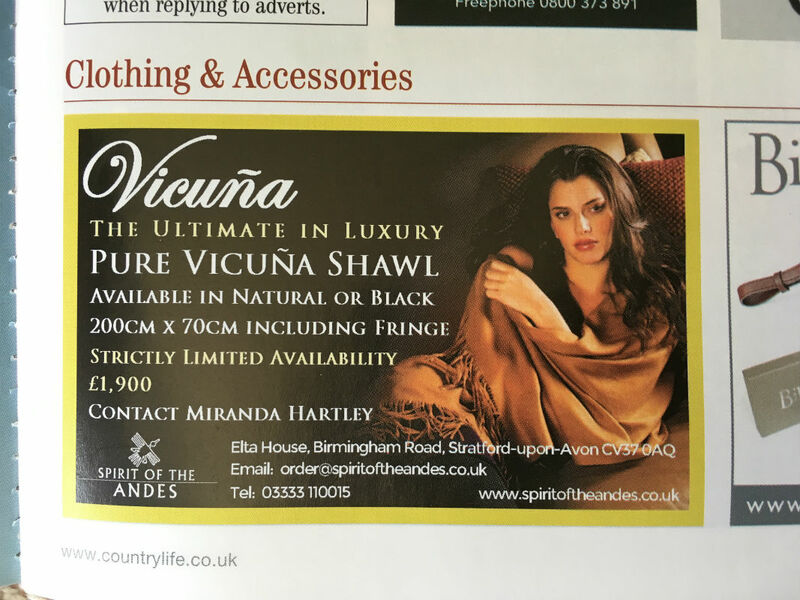 We now run this as a web business, working with a number of well-known companies and smaller businesses to promote their online goods and services. This is a website we host and manage, rather than one we designed ourselves. The company asked us to take over the running of their website, after seeing the quality and low cost of our services. Matthew Arnold School is a secondary school situated just outside Oxford. We redesigned their website to be more user-friendly and accessible, and conforming to WCAG 2.0 AAA accessibility guidelines. Two years later we revamped the site to use PHP and jQuery, and to make the most of advances in browser technology. We set up the site for staff to edit it with a content management system (CMS). The school needed a new-look intranet, so we redesigned the site to make use of CSS3 and jQuery technologies. We moved the intranet to the school's web server as staff are increasingly using computers at home, with the school's documents accessed via the school's Google Drive cloud storage. We then redesigned the site using Google Sites. There were areas of the site that are only available to staff or governors. Rugby Theatre is one of the largest amateur theatre companies in the country. They wanted us to redesign their website to have a modern "white space" look and feel, while maintaining the sense of history that the theatre and its building have. They also wanted to be able to update the website easily themselves. We trained them in using Dreamweaver for this, and provided support for those that updated the website. A Norwegian jeweller, based in England, asked us to make a website for her. She gave us the text and photos for the site, with the guideline of 'something bright and cheerful, maybe light blue with red text'. We designed the site, including a banner and background image, and developed the site which we also hosted and managed, including a Norwegian version of the site. West Oxford Schools Partnership is a group of primary schools and a secondary school in the west of Oxford. The organisation needed a website, so they approached us to create a logo, branding and a website for them. Having registered a domain name for them, we then sourced a logo for them, designed the typography for their logo, and worked on the look and feel of the website. 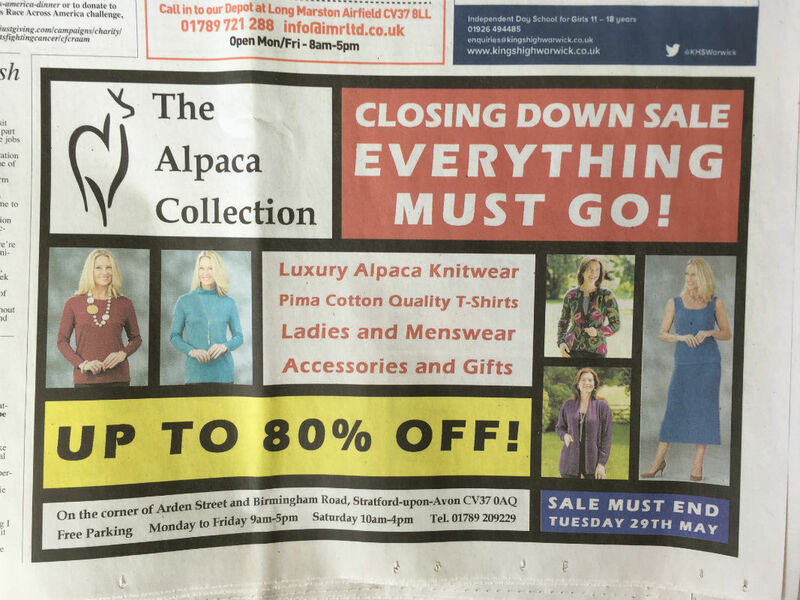 We hosted and managed the site for them for four years. Pemberton Associates wrote and published forecasts and reports for the automotive industry. We were approached by founder Max Pemberton to design and build their website because he liked the clean, modern web designs in our portfolio. As well as building and maintaining their website, we also hosted the site for them, having registered several appropriate domain names for the company. Whichford and Ascott Parish Council needed a web presence, so we created a website for them based on our design for their neighbouring parish council. They wanted to be able to embed documents in the website, as well as links, so we trained them on how to do this with our free CMS. For Sale Motorbikes was an affiliate marketing website that we set up using a similar design to Frank Guides. This website promoted a single moped company using pay-per-click (PPC) and search engine optimisation (SEO) techniques. Another website based on the Frank Guides/For Sale Motorbikes design, this was a small affiliate marketing website we set up in order to promote the sale of scooters and mopeds. HERO - Higher Education and Research Opportunities - was the official portal to higher education institutions in the UK from 2000-2009. We wireframed the site design and a content management system (CMS) for HERO staff to update it. We also managed the development of the site. Now known as 4 Talent, Channel 4's Ideas Factory was a movement to encourage creativity in young people and provide work experience for those interested in a media career. We wireframed the first incarnation of the Channel 4 Ideas Factory website. Air Miles, the scheme to reward consumers with free flights around the world, needed a website to invite companies to join the scheme. It's still going strong in a different guise, but we created the first Air Miles corporate website for them. Crick Software is a company that makes educational software. We redesigned their website to improve its usability, accessibility and text, and gave it a more up-to-date, modern and professional look and feel. We also introduced e-commerce to the site so the company could sell their products online. Learning Grids is a website containing free teaching materials for schools. This is a database-driven website, and after redesigning the interface, structure and navigation, we updated the look of the website to give it a more crisp, clean, modern look. The Clicker Books website was dedicated to selling children's books with accompanying on-screen, switch-accessible books - which we also made ourselves, using Adobe Flash. The website had a parent-centred and child-friendly style. Some software can be used by pressing one or two simple switches, which is particularly useful for those with physical disabilities. Switch Index was a website that included a constantly updated list of switch-accessible software. 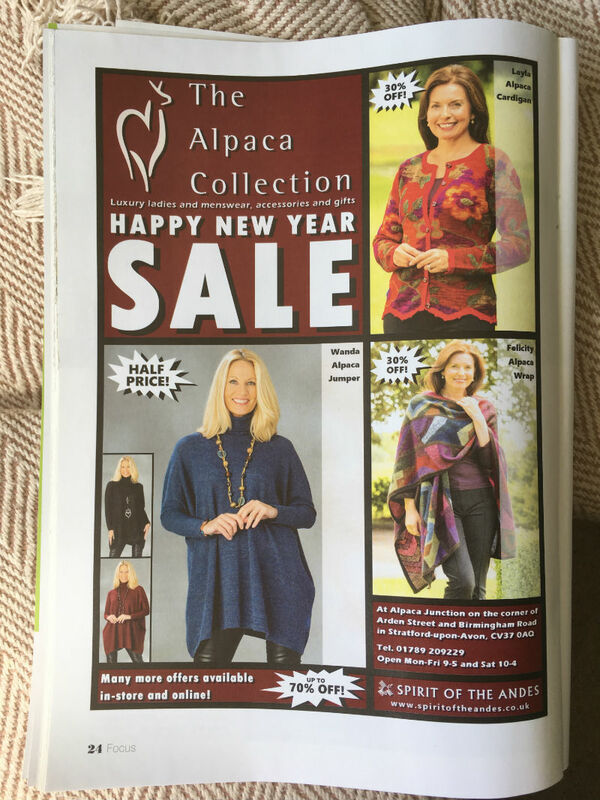 As well as web design, we also design for print: here are some examples of our work.